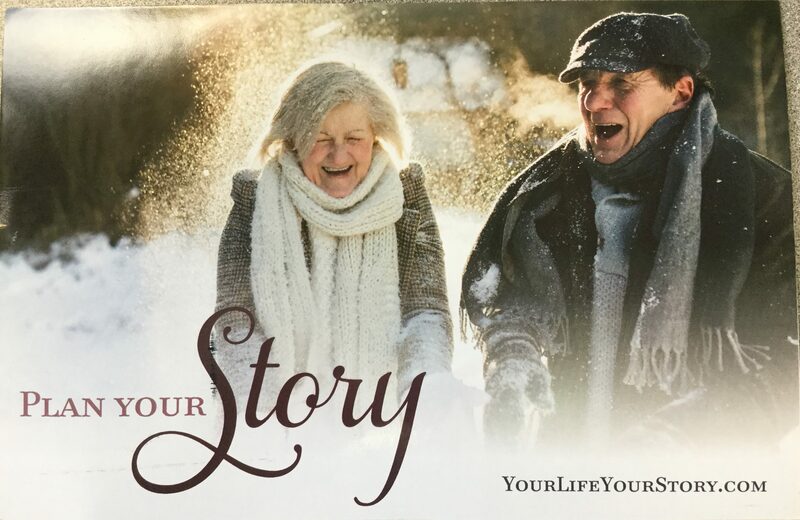 This entry was posted in Random Toy Box and tagged cemeteries, death, direct marketing, funny, humor, life story, self-publishing, strange New Years Resolutions, vanity press. ← Don’t call me a hero. I’m just a guy who touched feet so future generations could live fuller lives. It’s funny because it’s sad? I agree. It’s difficult to find the appropriate combination of funny and sad to describe it. 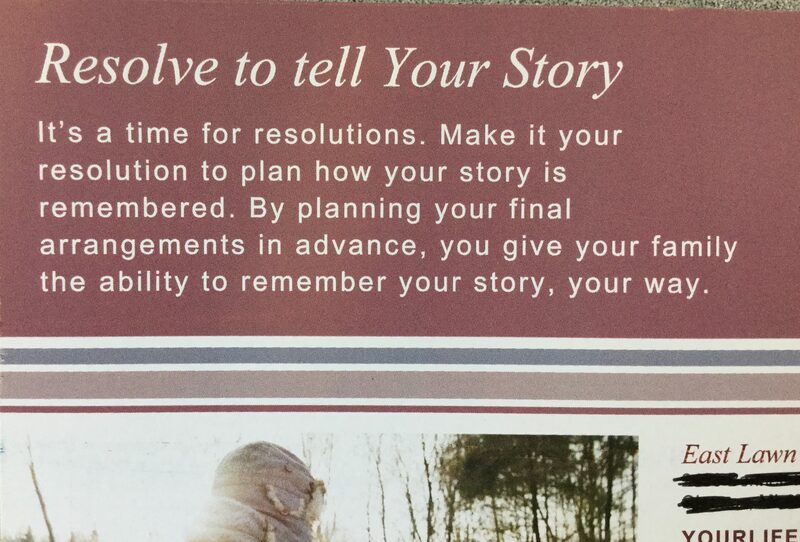 Glad to hear you plan on living this year. Crazy adds. Well, that’s the plan. We’ll see how it goes. Wow, Amy, that’s pretty tight control. I’m thinking about writing a self-glorifying song that all my mourners will be required to sing at my wake. Plenty of time. Relax and enjoy life. 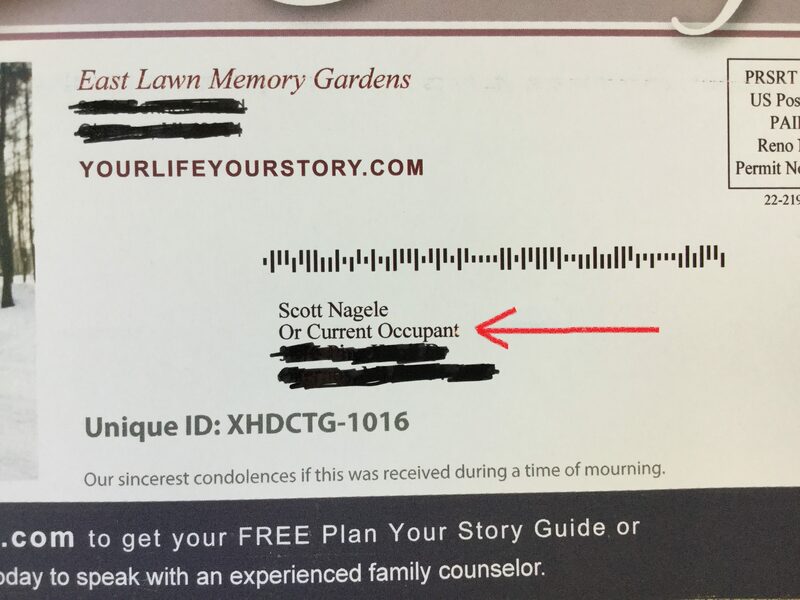 Well, Scott, you’ve now disparaged the proprietress of my final resting place…Eastlawn, but not the one at 1600 Pennsylvania. My final chapter will be written by MSU Medical Sciences. I requested of them internment -or ash sprinkling- on the banks of the Red Cedar, but those holding my “last rights” say it will be East Lawn Memory Garden, not the shady banks across from Spartan Stadium. That’s what I resolved many years ago. I vote for the Red Cedar. Who cares about all the duck poop? I loved this post! I wish WordPress had the little emojis like Facebook so I could have hit the “Wow” or “Haha” face instead of just Like. I personally have always told my loved ones that I don’t care what they do with my carcass after I’m gone — bury it in the garden, burn it, stuff it, whatever. Now that I’m on the shady side of 50 myself, I’m wondering if I shouldn’t consider pre-planning at some point, not to control anything but to save folks trouble. Then I think, “Oh, yeah, like anybody’s going to take any trouble over me.” Then I think maybe I WILL be controlling by forcing my family to make ALL the decisions about my corpse. I can always come back as a ghost and haunt them if I don’t like what they decide. Face it: there’s gonna be some reason you’ll want to come back and haunt them. You might as well just add the tacky funeral they threw for you as supplementary motive for rattling your chains at them. You’ve got a lot of really good ideas here. Just imagine what you’ll come up with once you start thinking about it. Maybe you can do the Spock thing where they shoot your pod onto a regenerating planet. Something to think about, you know, when you start thinking about it. 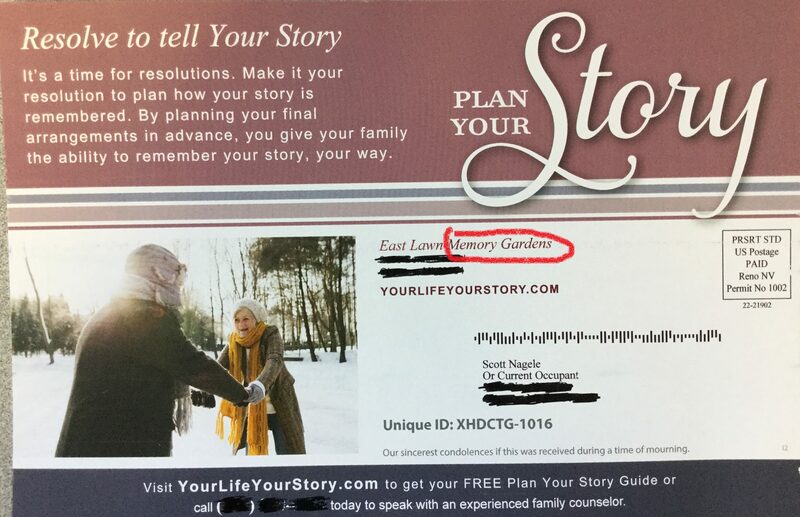 out of a piece of junk mail. Thank you, but the junk mail was pretty hysterical already.